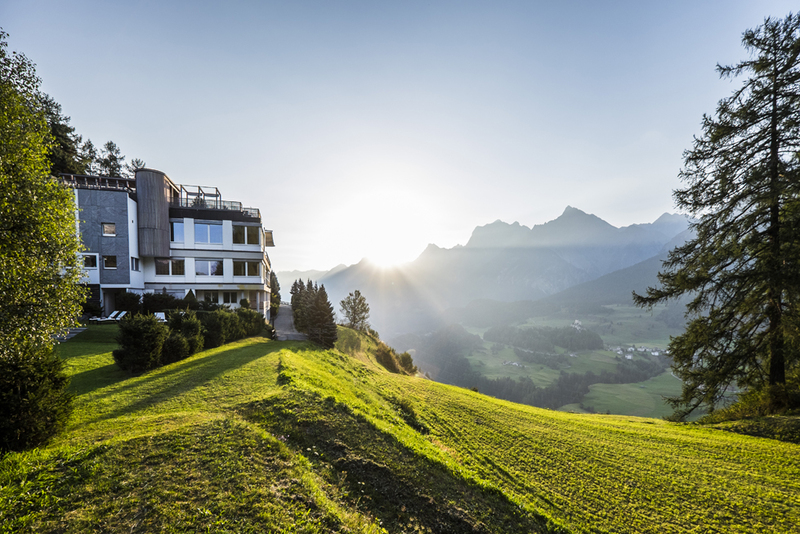 Five-star hideaway Hotel Paradies is located at 1650 m altitude on one of the Swiss Alps’ most beautiful sunny plateaus. And it offers a spectacular view of the Silvretta peaks beyond. 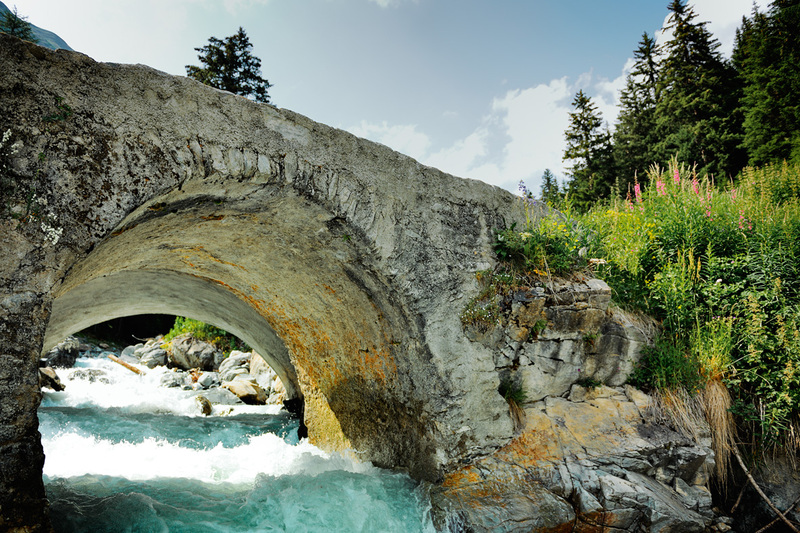 This delightful spot is situated in Ftan, in the Engadin Valley in the canton of Graubünden. The region is characterised by soaring peaks and tempestuous gorges. The source of the river Inn lies here. The river tumbles over steep rocks and flows through countless valleys to Austria and Germany. 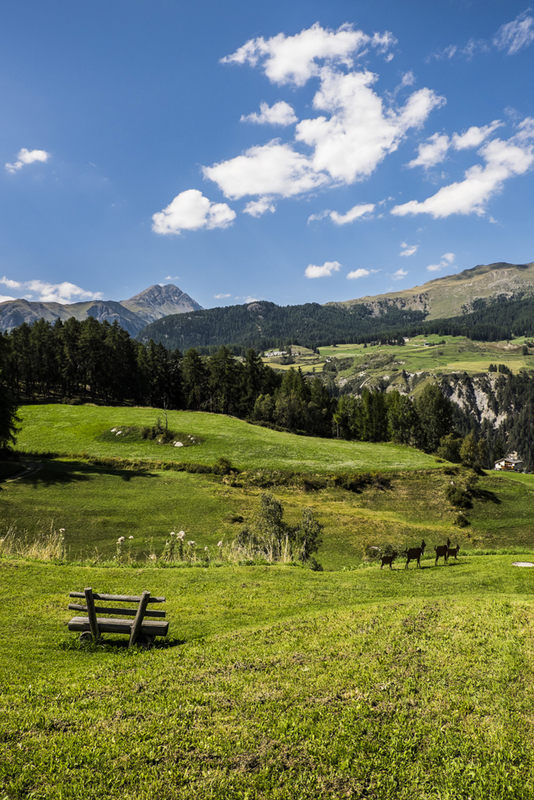 Engadin’s flora proffers a cornucopia of boundless delights to botanists. But its fauna (ranging from red deer to ibex to golden eagles) is absolutely stunning too. 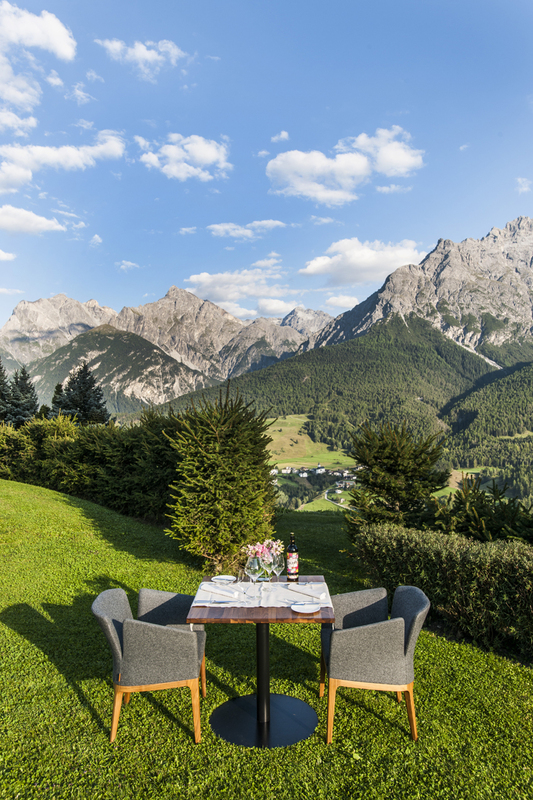 Numerous villages in the area, for example Ftan, Guarda, Ardez, Baraigla, Tarasp, Scuol, Pradella, S-Charl and many others, have retained their original splendour up to the present day. 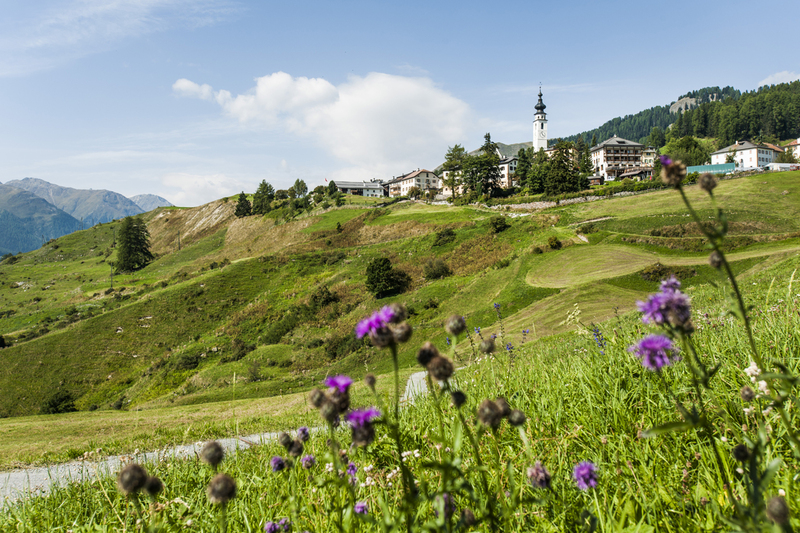 The majority of the locals speak Rhaeto-Romanic, Switzerland’s fourth official language. Up here there are plenty of insider tips to unearth. The region has products to appeal to all the senses and boasts traditional crafts like pottery, painting and music famous outside the country too. The hotel is comprised of cube-shaped forms. Some of these are in a terrace layout, made of concrete and wood and call Bauhaus style to mind. A warm and inviting atmosphere prevails inside. Guests encounter a large room, flooded with light, with upholstered fabric sofas and cushions in red, brown and beige tones. The long antique wooden table serves as the reception, surrounded by other restored pieces of furniture and mirrors. The Bechstein grand piano in front of the bar, the crackling fire in the hearth and the unique view of the sweeping Lischana mountain range seem to say welcome home. Original paintings and graphics from contemporary artists and sumptuous oriental carpets transform Paradies into an oasis for body and soul. The patio offers a direct view of the valley, inviting sun-seekers to linger a while. Guests might like a stroll in the hotel’s newly designed garden, or in warmer weather to breathe in the fragrance of wild thyme and fresh mountain air while relaxing on sun loungers. Major Domo Meike Bambach, from a very young age, her life was characterised by wanderlust and joie de vivre. After graduating from Cornell University in New York, she worked throughout the world in various hotels in Beverly Hills, Hong Kong, Australia and England. 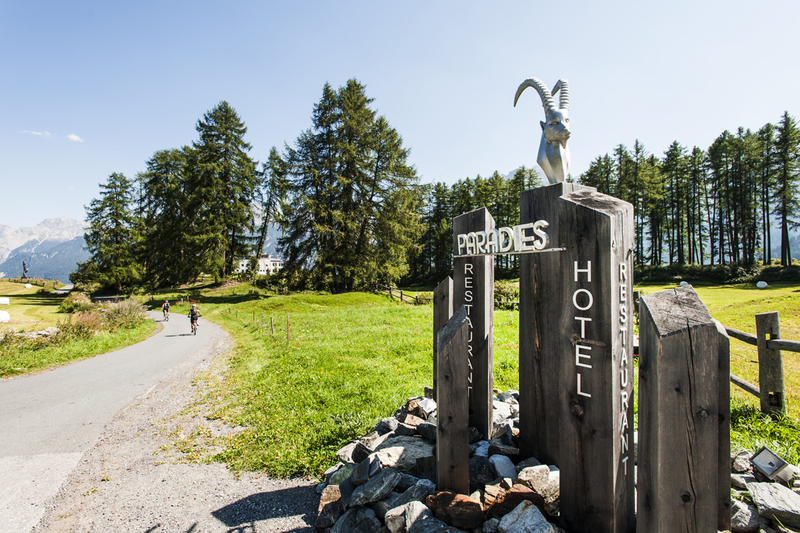 In 2008, hotel director Meike Bambach (44) moved from Hamburg’s Louis C. Jacob to Paradies Hotel in Ftan. She describes managing this little jewel in the Swiss Mountains as her most appealing challenge to date. She and her team aim to preserve the hotel and its history and to establish it as a hideaway for pleasure-seekers, climbers and gourmets alike. As the mother of two children, she loves the great outdoors and has sought and found contact to the area and its people. 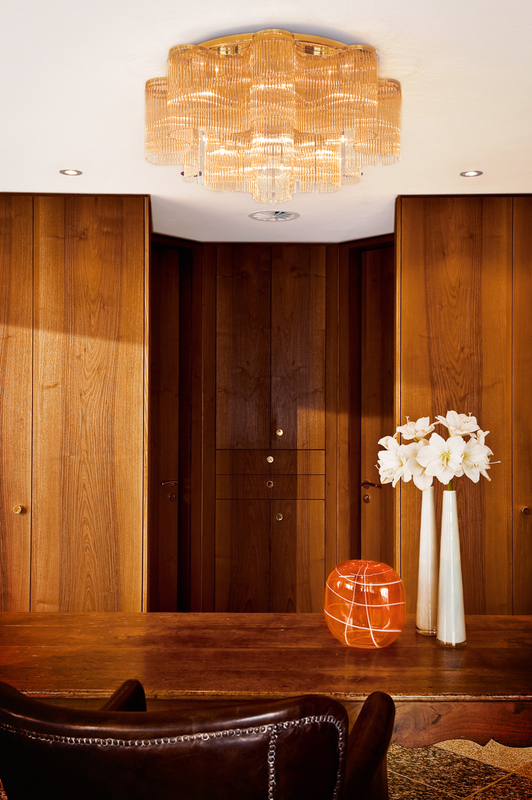 Consequently, the hotel echoes much personal charm and attention to detail everywhere you look. Three grand suites (50-60m2), six suites and six junior suites (40-45m2), four double and four single rooms offer guests their own private retreat. 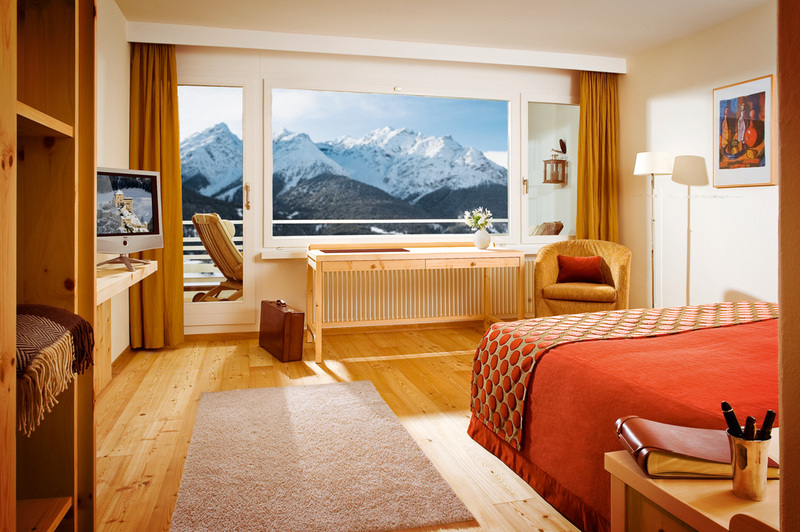 All rooms are fitted with Swiss pine, revealing the typical fragrance of the alpine air, which is relaxing and invigorating at the same time. The wood is said to have an anti-allergic effect as its essential oils foster particularly relaxing slumber. All rooms have a bathroom and/or shower made of local marble or granite. Separate dressing rooms, or walk-in wardrobes and modern equipment (safes, flat-screen TVs, telephones etc.) ensure top-level comfort. Custom-made breakfast tables as well as bedspreads fashioned from superb fabrics, lend all the rooms a personal touch. Some of the suites have bathrooms with direct views of the mountains, or their own fireplaces. Sights to behold are the sunrise and sunset over the majestic peaks from the south-facing balconies or patios that belong to all the rooms and suites. They all offer comfortable teak loungers and chairs. For a particularly delightful and romantic touch, they also have different night lanterns. 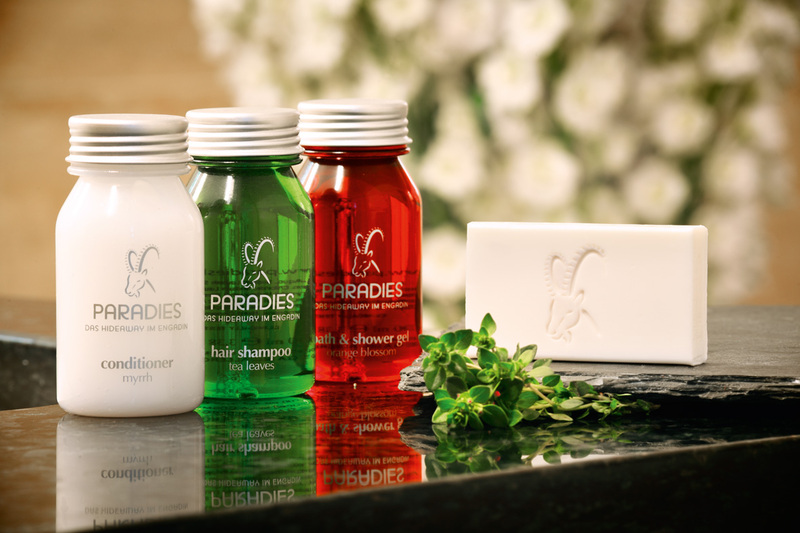 Specially selected beauty products ensure bodies are in peak condition and smell superb. The hotel’s tip is to enjoy a calming “Dorma Bain” or a refreshing “Allegra” tea. The teas contain lemon balm, St. John’s wort, spring primrose and many other fresh herbs that are grown organically and composed in Cornelia Josche’s “Kräuter-Fabrik” in Guarda. But man’s best friend is also promised a wonderful stay at Paradies at any time. Owner- accompanied dogs are warmly welcomed and looked after by reception staff. In the large suites, even big dogs have more than enough space. Upon arrival, they can expect luxurious baskets with hand-sewn, chequered cotton covers, including bowls that all match the rooms’ interiors. And of course, man’s faithful companion will also be served a freshly prepared meal here too. Home-made cakes for dogs from the Paradies kitchen complete the offering. Garden of Eden Spa. 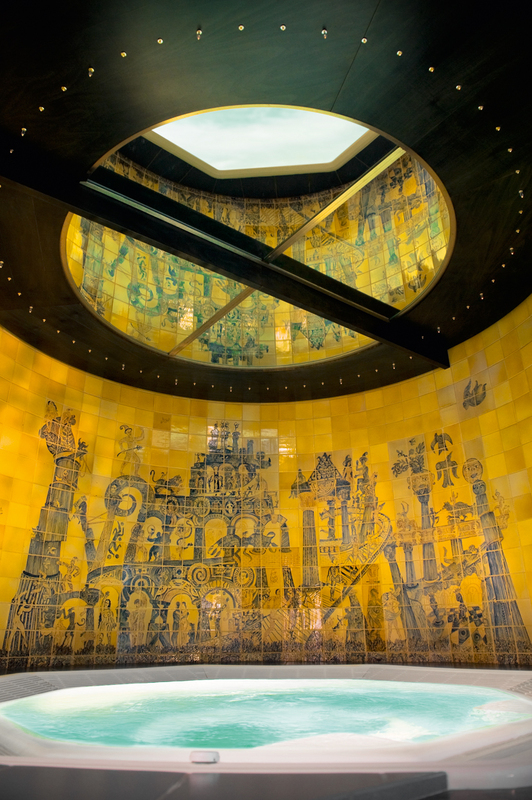 Since summer 2011, the Garden of Eden spa in Hotel Paradies has covered two floors. The ground floor houses the Jacuzzi, the sauna and the steam bath. In the shower- or changing- room, the soothing fragrance of Swiss pine is everywhere and carefully chosen colours ensure relaxation in its purist form. Anyone seeking fresh, cool alpine air just needs to climb the stairs and onto the roof. Two Dutch tubs invite guests to take a pleasantly warm bath. 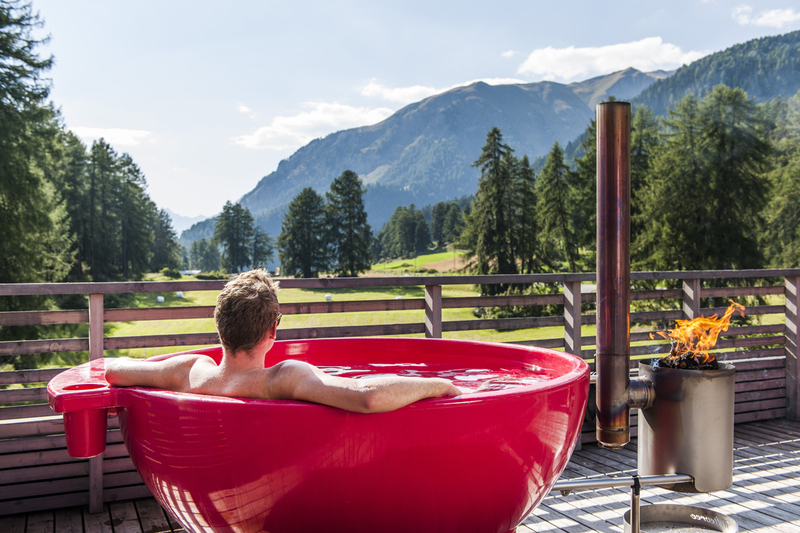 The dedicated butler turns on the water, heating up the tubs with wood for up to four people. Anyone preferring a little more exercise might venture onto the foot-reflex-zone path Taosensa, or play a mini round of golf with friends in the garden on the new putting green. In shape with yoga and massages. 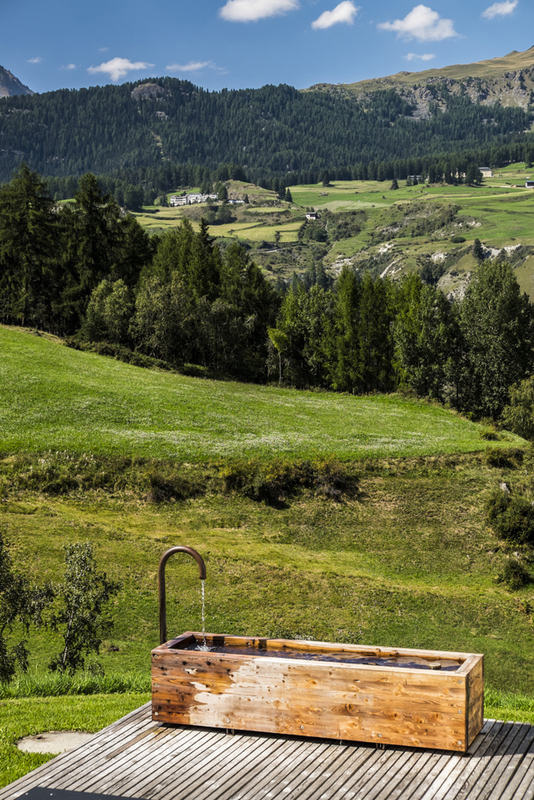 At Paradies, many roads lead to Rome in terms of relaxation, with yoga sessions on the alpine meadow, massage methods from India, or compresses made with local herbs. Ayurveda specialist Barbara Pohl whisks guests away into a world of utter relaxation by using traditional Indian arts of healing. Drawing on ten years’ experience, she offers traditional Marma whole-body massages, to Shirodhara, to Padanganjali massages where feet carry out deep massages. 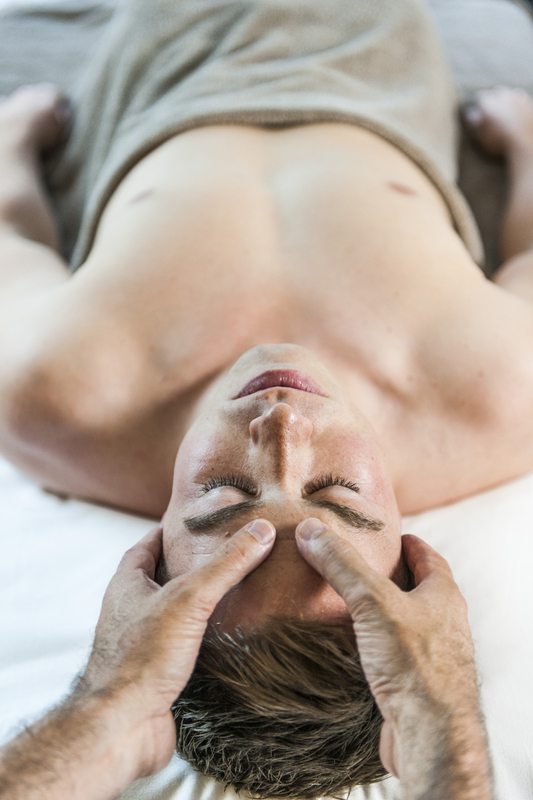 Very popular in addition to the aroma- and hot-stone massage is Dorn Breuss therapy where the spine is treated particularly gently. The Asian body therapy Shiatsu eases tenseness and energy blocks by specific rotation of the joints and stretching. And covered in local herbs and surrounded by the fragrance of the flower meadows, the alpine herb compress cloaks the body into a state of warm repose. 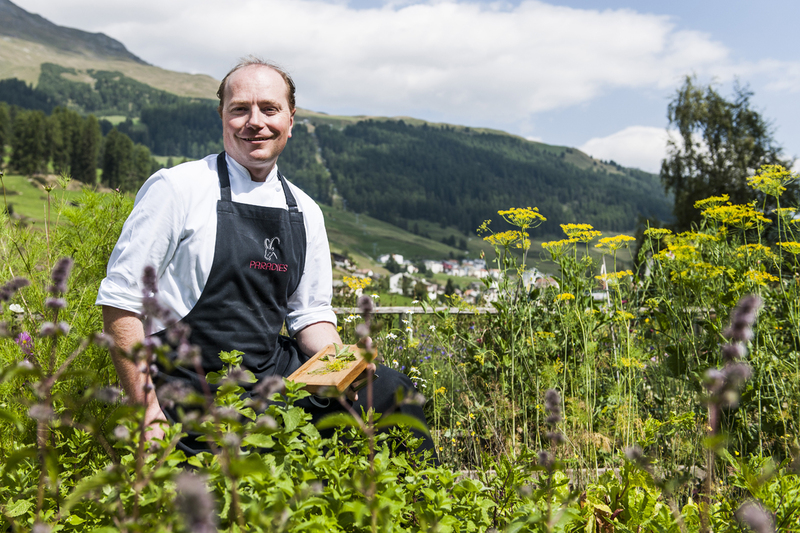 Daniel Stütz has been at the helm of the Paradies kitchen since October 2014. 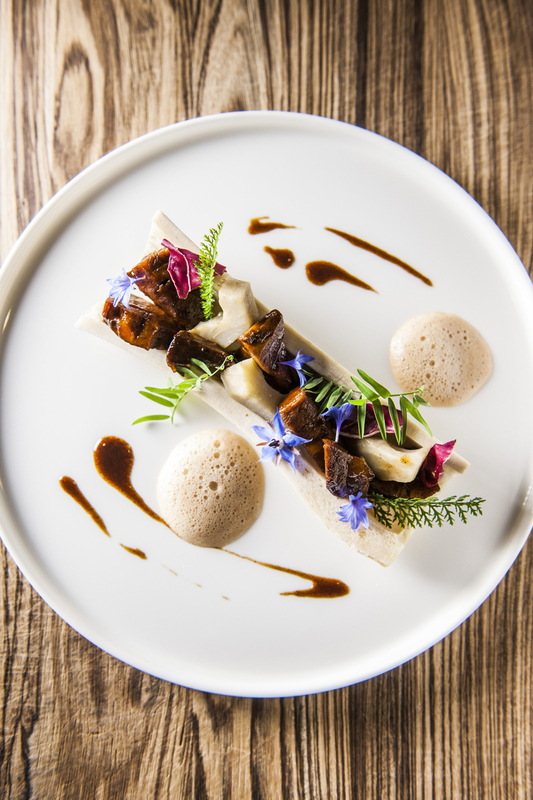 The talented German will continue the popular “Chadafö unica” concept at Paradies, which is a modern take on cuisine from the lower Engadin valley based on regional produce. 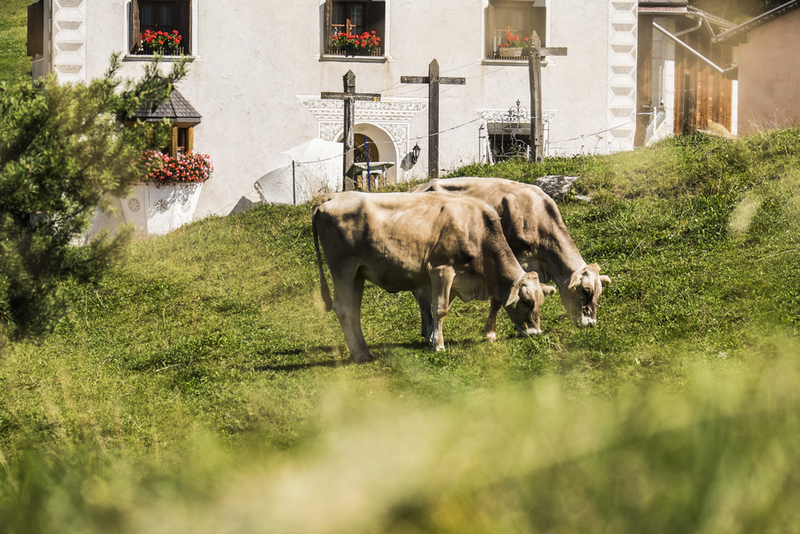 And he’s starting off with something of a sensation: The previous Stüva and award-winning restaurant “L’Autezza” will join forces to offer artisan meats at what is called “Charn Alpina”. 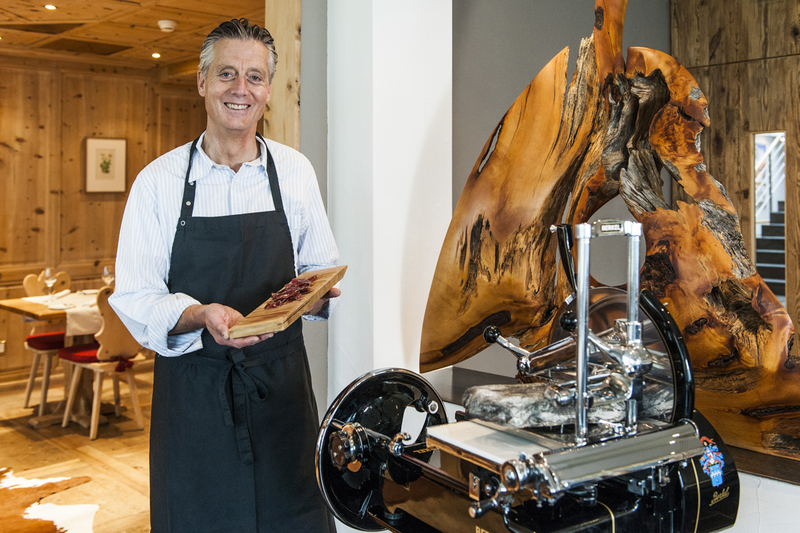 Daniel Stütz will be presenting exclusive treats from sought-after butcher Ludwig Hatecke from Scuol. Charn Alpina. In Rhaeto-Romanic, Charn Alpina means alpine meat. 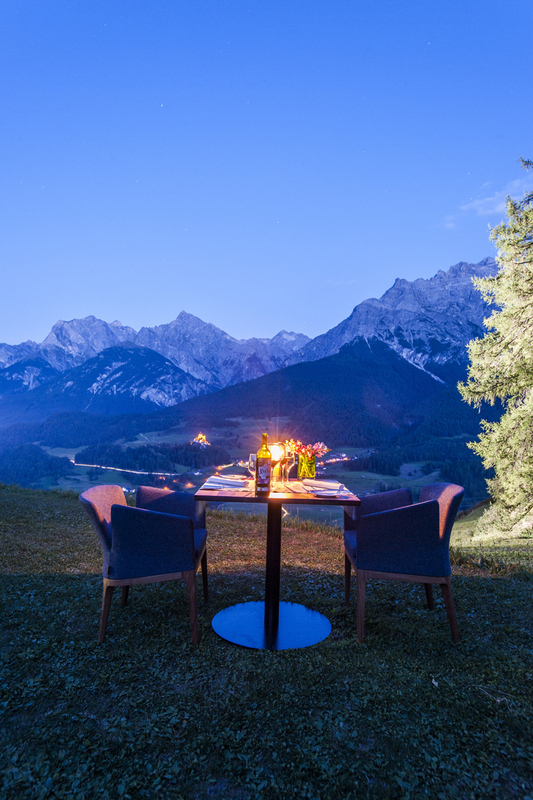 The idea for this artisan-meat offering came when Hotel Paradies worked with Ludwig Hatecke, a successful master butcher and genius with meat from Scuol. The result is a modern twist on authentic cuisine that is based on regional delicacies throughout. 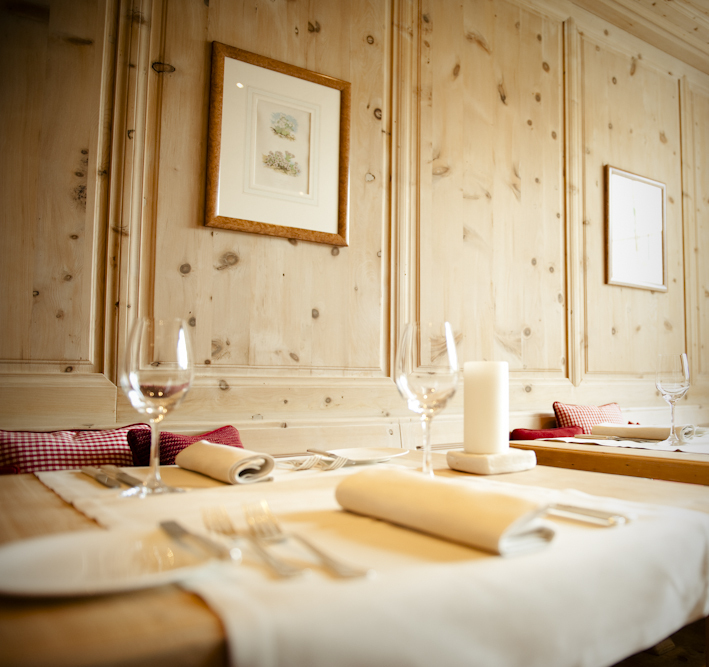 Ludwig Hatecke provides the final touches in true Engadin style. 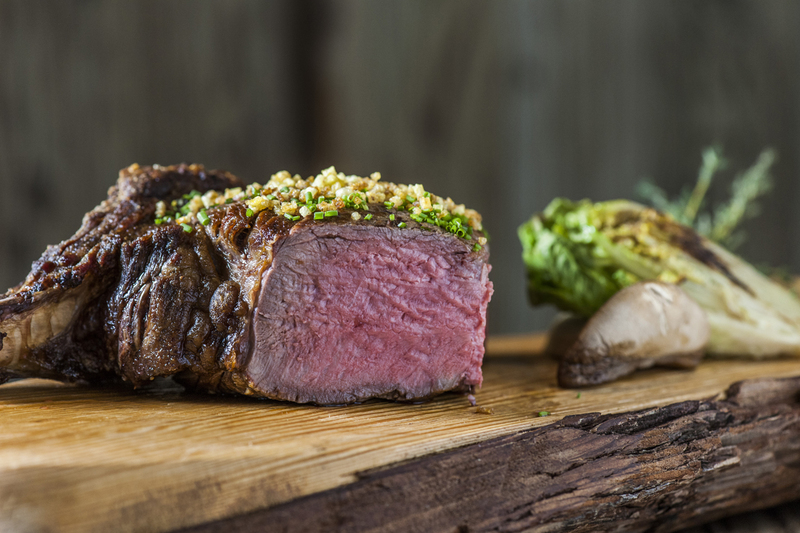 In the future, Charm Alpina will serve first-class meat specialities that stem from his butcher’s shop. 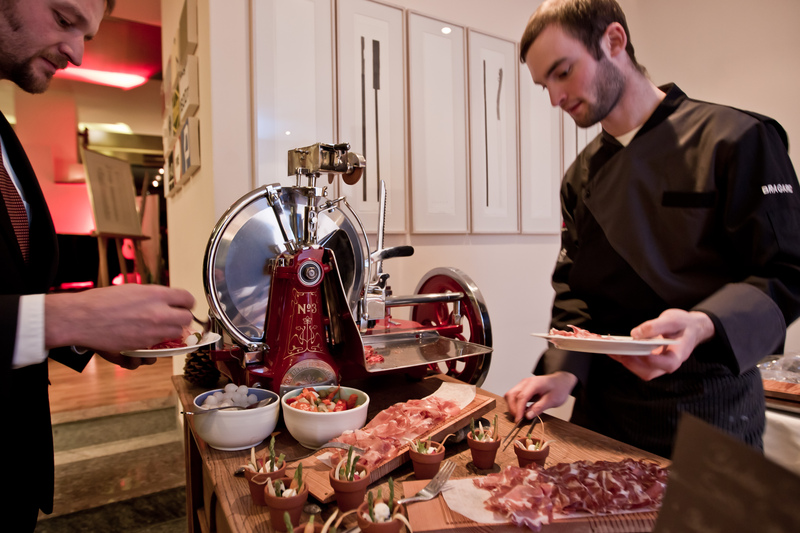 Daniel Stütz will apply all his skills to produce dishes of sophistication. The meat will be pan-fried, smoked, turned into sausages, finely sliced, superbly fileted and much more. Each piece of meat has its own story and is part of the bigger picture that Ludwig Hatecke, as a butcher and connoisseur of this local foodstuff, is constantly fascinated with. La Cucagna. In addition to Charn Alpina, La Cucagna is also a tempting option. 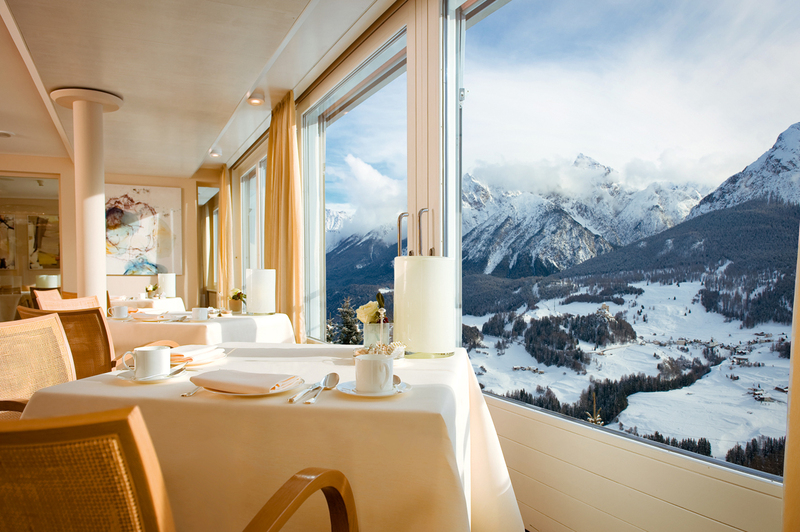 With a wide-sweeping view of the surrounding mountains, it welcomes guests to breakfast each morning. A whole host of tasty propositions and sweet temptations are presented on the long Italian cherry table in the middle of the room. There’s exclusive buffalo milk from Ftan farmers, jams and organic yoghurt from the region, freshly baked thin fruit flans and of course delicious nut torte from Cantieni, fine Salsiz (a smoked sausage) from Hatecke, muesli, cheese from a small village cheesemaker’s, and various types of bread. This delicious breakfast is accompanied by “Masdüra de la chasa”, a coffee blend roasted especially for Hotel Paradies in Café Badilatti in Zuoz. There is no other coffee roasting house at such high altitude in the whole of Europe. 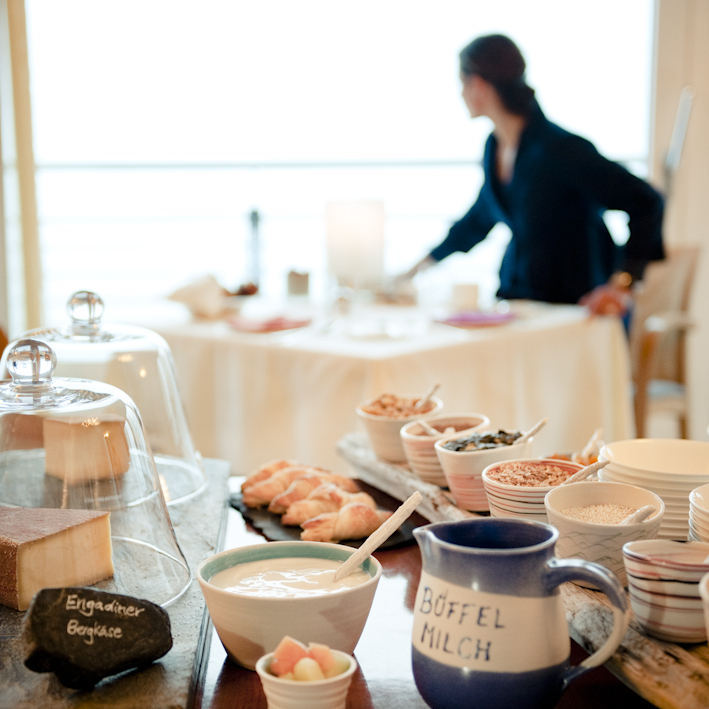 Guests are invited to take breakfast as long as they want and even savour it on the patio in summer. For dessert, Charn Alpina and La Cucagna serve classic Engadin confectionery that has caused a stir at almost 900 places across the world, from Turku to Sicily, from Gibraltar to the Russian court. Daniel Stütz offers a classy reinterpretation of these traditional recipes. The menu features marzipan flowers, crispy confectionery, crumbly biscuits and brittle, as well as homemade candied fruit and fresh lemonades and orangeades. A Bischoff is also served, a forgotten cold and hot drink made of wine and bitter oranges. 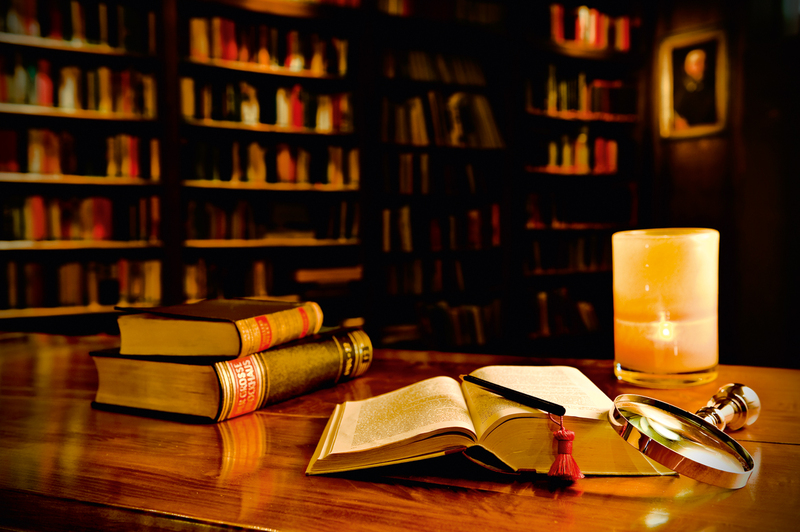 Long winter evenings can be spent in the hotel’s own library. There are plenty of books to discover on the floor-to-ceiling shelves. 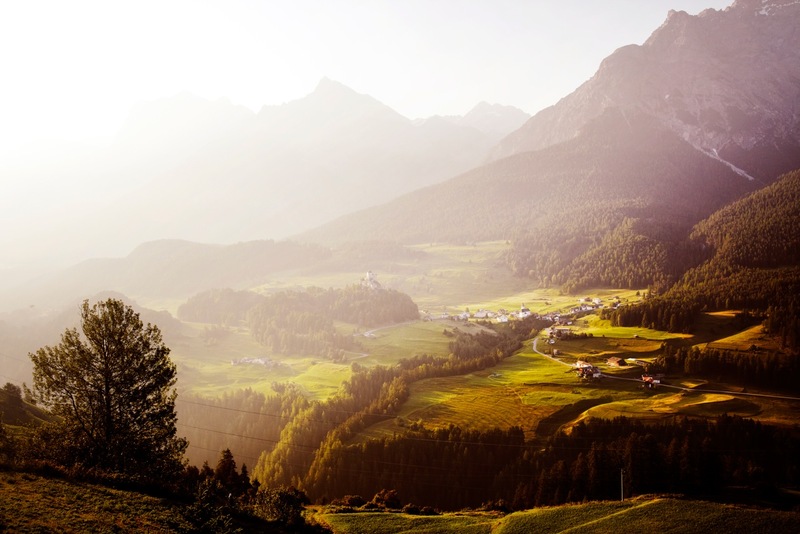 Bibliophiles can sink into one of the soft leather chairs and escape undisturbed to the world of novels, detective stories or children’s tales, like Schellen Ursli, the boy from Engadin. Works from the distant past, but also the present, such as anthologies of poems, biographies and stories from local authors are to be found in the Beyer’s former lounge. Some of these include oeuvres by Engadin’s Cla Biert (1920-1981) in Rhaeto-Romanic, or wonderful poems by Luisa Famos (1930-1974), also born in Lower Engadin and Engadin’s answer to the likes of Lasker-Schüler, Bachmann or Droste. Marcella Meier also provided impressive insight into life in the mountains in her book “Das grüne Seidentuch” (The green silk scarf) which includes a lot of background information and exciting stories from Engadin. Of course the shelves also house beautiful coffee-table books and chronicles of Ftan too. There are also political treatises in the library, some for example from the Perestroika era. But anyone otherwise inclined can enjoy a game of chess, or backgammon or tinker away on the piano. 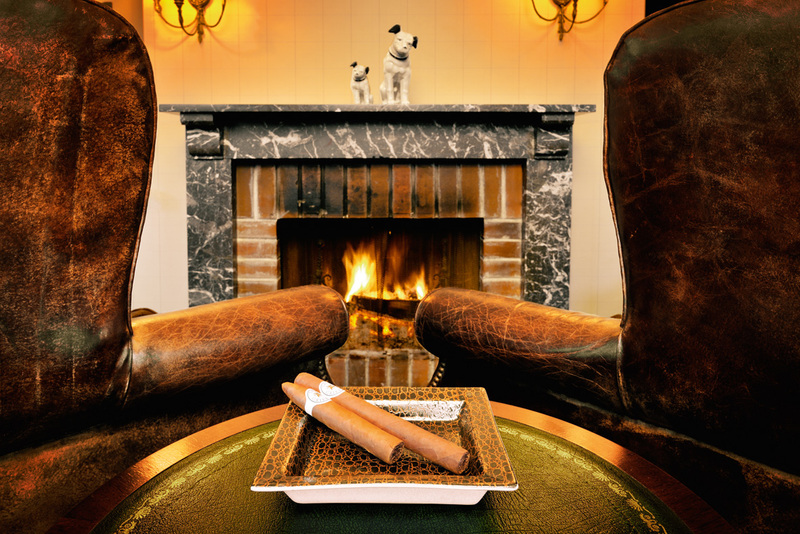 Smokers can withdraw to the smoking salon (fumoir) with its British charm. With chequered wallpaper and heavy, old leather furniture it’s the ideal spot for a cigar or a glass of whisky in front of the open fire. 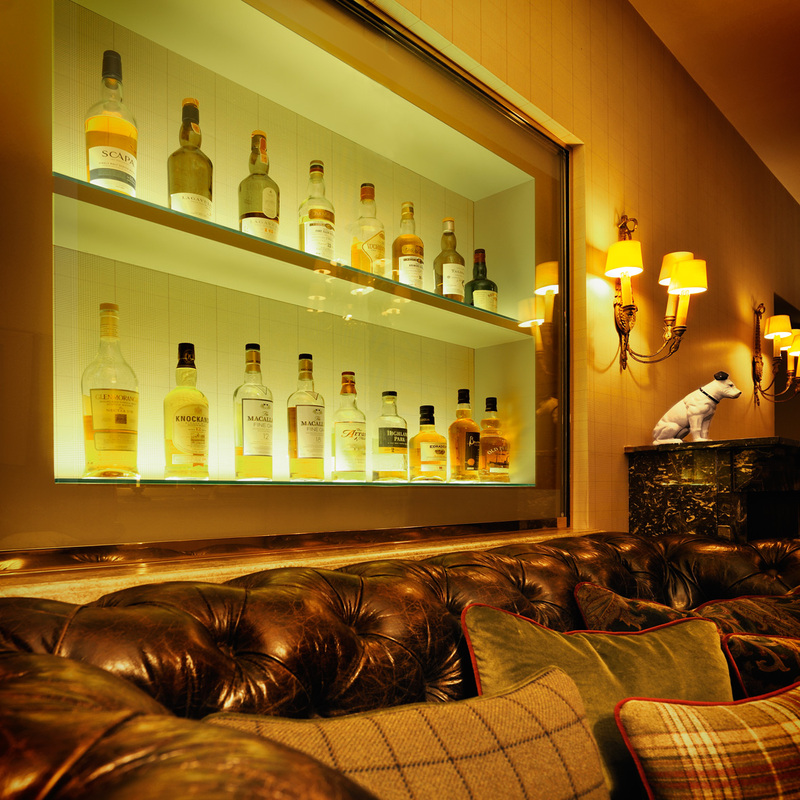 Decorative velvet and tweed cushions lend the library and the salon a lived-in, warm feel that encourages people to stay. Leisure activities for body and soul. 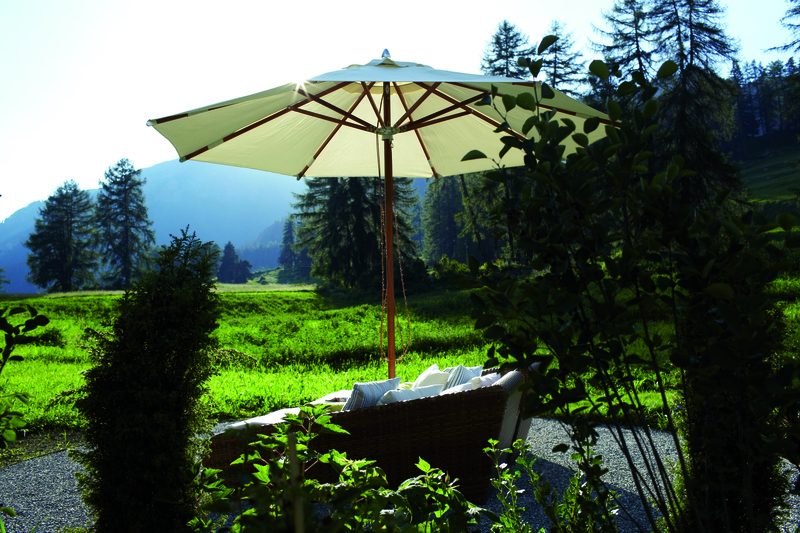 There are many different ways to relax, take exercise and recharge those batteries in Engadin. Estranged from the rigours of day-to-day life, it’s easy to let your mind wander and simply take in the beauty and fascination of the surrounding landscape. 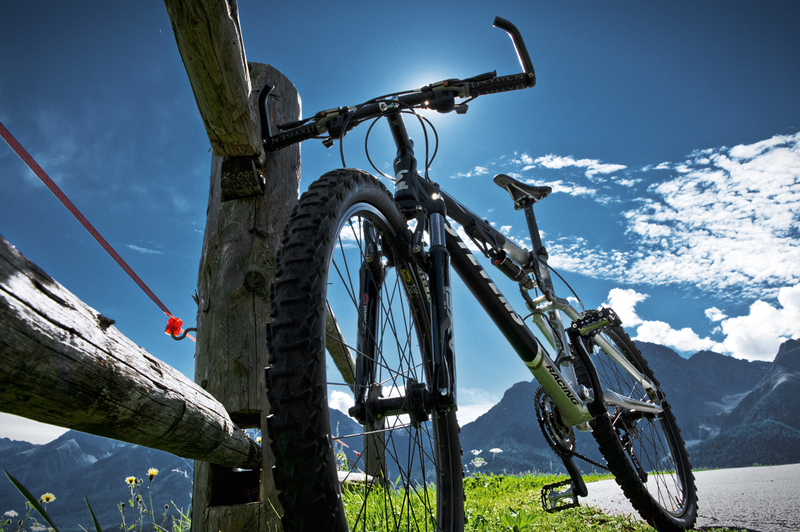 There’s virtually no limit to the sporting activities available like walking, cycling or horseback riding. A remote Swiss pine forest. Hiking for all capabilities. The thrill of mountain biking. Soar to new heights with Flyer bikes. Winter sports in abundance. With its own chair-, ski-lifts and skiing school, Ftan is affiliated to the Motta Naluns skiing resort. 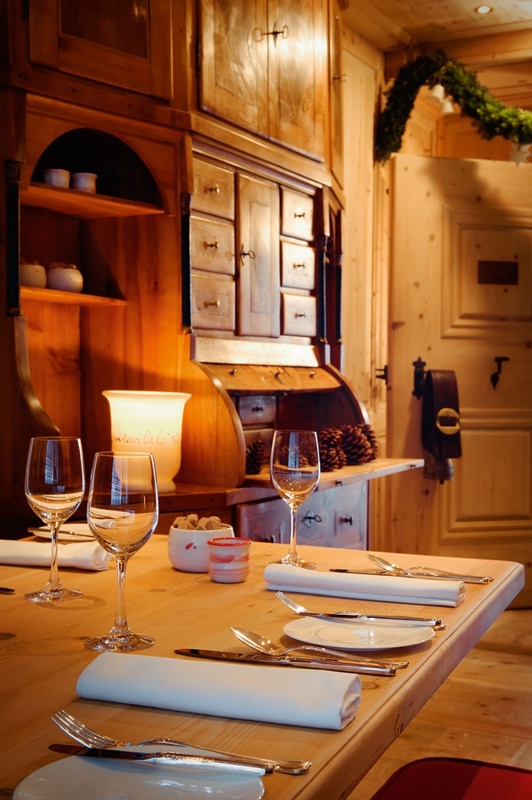 A romantic coach-ride to a fondue and much more. 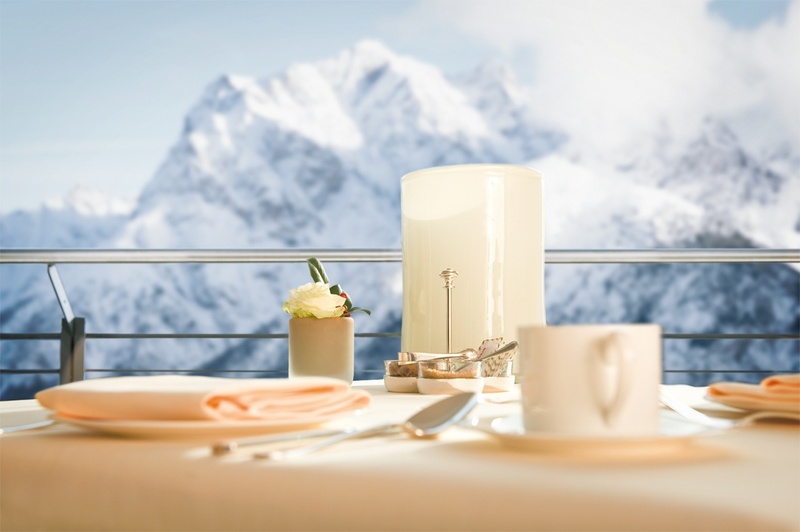 Couples wanting a white wedding encounter a snow-laden Hotel Paradies in winter. Romantic horse-drawn sleigh rides, flares in the snow, or crackling open fires turn the event into a unique experience for the happy couple and their guests. But in spring, summer or autumn too, vibrant countryside and mild breezes await and entice visitors to sip on aperitifs on the sunny patio. Up here, couples embark on marital bliss, quite literally with their heads above the clouds. A special, themed programme of accompanying events and excursions ensure unforgettable memories. Options could include a wedding in the church in Ftan, which is protected as a historic building, or in the romantic chapel at Tarasp Castle. On request, the bride and groom can book the entire hotel, including service and catering for the wedding party of up to 150 people.